Tofu loaf: it may sound gross, but is mighty tasty. Today’s photo is of the tofu loaf I made last night: tofu loaf as opposed to meat loaf. I’m still boycotting kosher beef. Tofu, walnuts, brown rice, and cornbread instead of cow. Although the crunchy-granola-hippie-whole-foods-vegan cookbook I got this recipe from did not tell me to add ketchup, everyone knows that real meatloaf demands ketchup, and lots of it. So, I topped it off with the requisite two cups. What is not to love about a recipe that calls for two cups of ketchup? Excessive and disproportionate use of a condiment elicits deep admiration, just for chutzpah alone. And here I must confess something. When I was pregnant with what is now the Toddler, I had manic cravings for french fries. They had to be french fries from Fat Moe’s, which is one of those fast food huts so small they only do drive-through, and with only one window. My husband dashed out several times a week to fetch a double order of fries and a Pepsi (I shudder at revealing any of this, but especially that I supported PepsiCo in any manner). Every time, Fat Moe’s added a few ketchup packs to the bag. 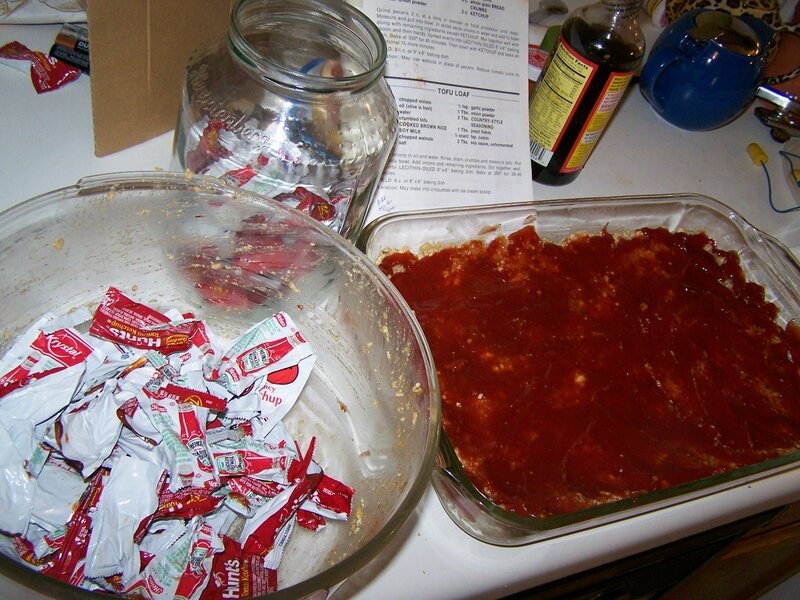 Ketchup was one of those foods I suddenly hated, so I saved all the packets in a jar. The thrifty Balabusta in me would never consider throwing them away, and the paranoid germaphobic Mom in me would never consider expecting a restaurant to accept returned food (possibly contaminated on purpose) for redistribution. So, they all went into a jar. And then a bigger jar. And then an even bigger jar. By the time my french fry jag was over, I had filled up a giant pickle jar and an iced tea pitcher. One day, I thought, I would use all that ketchup. I would put it on top of a meat loaf. But then, when I did have the baby, the last thing I felt like doing was cooking. And then, the whole kosher meat debacle hit the fan and kept hitting the fan until I didn’t know which brands to trust and which brands to boycott. Which means we’ve been in-house vegetarians for a while now. So, yesterday I hauled out the vegan cookbook and found my old recipe for Tofu Loaf. It was strangely satisfying to cut open each little ketchup pack with a pair of the Teenager’s old kindergarten scissors, one by one, and ploop it out onto the loaf, shmooshing it to the very edges so the perimeter would get all burned and bubbly in the oven. I like to think I have enabled my ketchup packs to finally fulfill their intended destiny, but with far more dignity than as a dip for mere fries. A redemption kosher in more ways than one. This entry was posted in Uncategorized and tagged kosher. Bookmark the permalink.